He was raised on the Wright Patterson Air Force Base near Dayton, Ohio and in Kenosha, Wisconsin. He was a member of Emmanuel Christian Center. Religion provided by the Star Tribune Voter's Guide, 2008; and Politics in Minnesota, the Directory, 2009-2010. Schmidtke, Erin. "Collaboration Over Discipline. Whips Rely on Communication as Session Moves Forward." 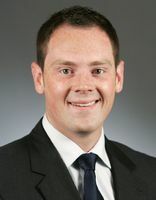 Session Weekly, St. Paul: Minnesota House of Representatives Information Office, February 24, 2012, p. 19. Berggren, Kris. "Honored to Serve. Sanders Focuses on Kitchen-Table Issues." Session Weekly, St. Paul: Minnesota House of Representatives Information Office, January 30, 2009, p. 16.